Birmingham have completed the signing of midfielder Olivier Kapo from Italian Serie A side Juventus for £3m. The 27-year-old French international has signed a three-year contract at St Andrews with a further two-year option. 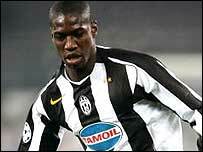 Kapo started at Auxerre and joined Juve in 2004. He has had loan spells with both Monaco and Levante after struggling to break into Juve's side. Kapo is Birmingham's fourth signing of the summer, after Fabrice Muamba, Stuart Parnaby and Garry O'Connor.